Look, I'm not going to beat around the bush here. Denis Villeneuve's Arrival is a flat out, stone cold, no questions asked, science fiction masterpiece. Science fiction has been lacking recently in excellent mainstream offerings, with the latest being Christopher Nolan's Interstellar - a film that had all the makings of an instant classic but fell short with a bloated run time and an over-reliance on exposition to explain its own brilliance. Had Nolan's screenplay held off a bit, and allowed the story to be explained visually and with the viewer's own imagination, we would be talking about it for years to come. Instead, Arrival looks set to be the defining science fiction film of the decade. It is a powerful, thrilling story that focuses on the small things and still feels enormous. It is moving, it is exciting and it is smart. It is without question the best film of 2016 thus far, and I'd put my life's savings on it staying there. 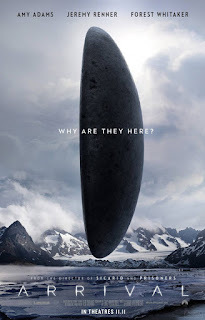 To Summarise: Uniquely intense, emotionally stunning, thematically powerful and spectacularly told, Arrival is a superlative film that brings together all of its astounding components for a mind blowing final act. A flat out science-fiction masterpiece.